In the fall of 2016, I spent ten days on the road with a band from New Jersey called Young Rising Sons. 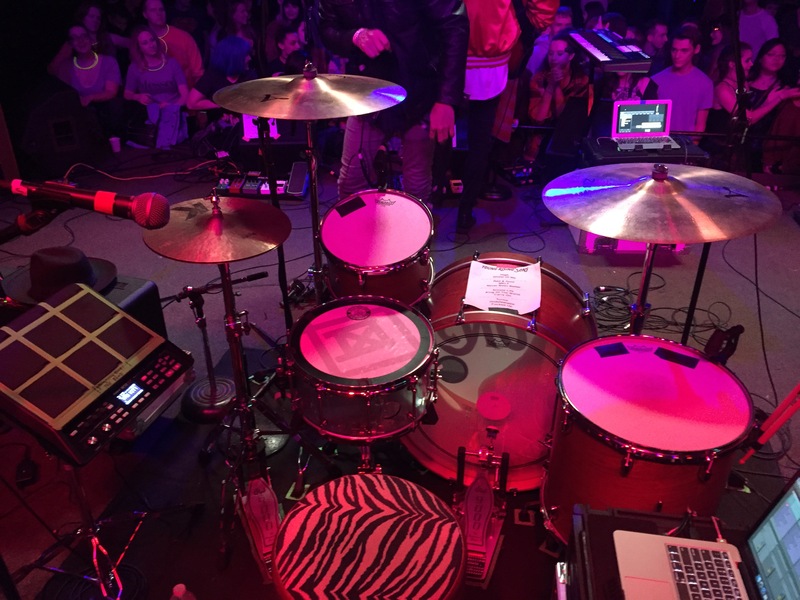 Part of my duties were setting up and tearing down drummer Steve Patrick’s rig every night, and that opportunity gave me some amazing insight into Patrick’s work and what it means to be a professional musician. I got an excellent behind the scenes look at how much work goes into planning and executing a successful tour, and how integral Patrick was in keeping each night’s performance on point. My favorite experience however, was during fan meet-and-greets when Patrick would not rest until he had met every single fan, signed something for them, and taken loads of photos. His compassion for fans is unrivaled and his enthusiasm for his craft is what lead me to respect him so much today. Patrick has been a great friend since the end of that tour, and he was kind enough to answer a few of my questions for the inaugural article of a new interview series titled “Drummer’s Corner.” In this series I will explore what it’s like for contemporary drummers on the road, in the studio, and navigating the ever-confusing business side of today’s music industry. ZF: The first thing I noticed about your kit was the muffling on your snare drum. Some drummers use moon gels or studio rings, but you’ve got something a little different. Please explain what it is and how it differs from other products on the market. SP: I’ve recently been using something called a Big Fat Snare Drum. They are a company based out of Massachusetts I believe. I randomly happened across the 14” Original BFSD at a local music shop and bought it on a whim as I heard a friend of mine raving about it. I took it and dropped it on my snare and immediately noticed the difference. Since then I’ve used it on all of my snares and it does exactly what it says it does: turns your snare into a big fat tonal masterpiece. I’ve been using a Truth Custom Coke Bottle Acrylic snare recently and it has tons of crack to it, but lacks in low end and has a lot of overtones. The BFSD tightens it up and no matter how the head is tuned, it has a perfect, fat beefy tone to it. It also is great on fly dates where we have to use rented backline equipment. 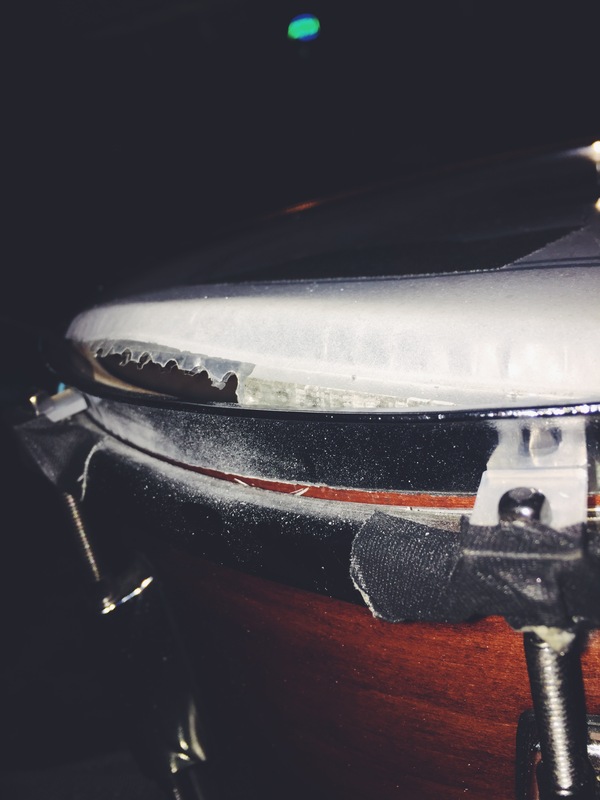 No more tuning a snare that has been abused for years, you just drop on the BFSD and go. ZF: Do you use a different kit for recording than you do performing live? SP: Yeah, live I play a Gretsch kit and it is just great across the board for any application. It’s so versatile and sounds gorgeous even if we toss it up on stage and go without tuning it. It’s my favorite kit I’ve ever owned and I can’t say enough good things about it, but when we are recording we have more time and space to find out what works; so we kind of create a Frankenstein drum kit to get all of the sounds we are looking for on a song-to-song basis. Most recently we used a Bubinga Tama Starclassic and it sounds beautiful. The kick has this controlled low end thump that is perfect for the studio, and the floor tom has a bit of a growl but doesn’t break up when you tune it low, which makes it perfect for all the tom parts I play. We tend to mix and match cymbals based on the song, but I’ve always used Zildjian K Custom Dark Hats, they are super dry and smoky sounding but still really musical, so they work in almost any vibe. ZF: Which producer(s) do you normally record with, and what is the recording process like for tracking drums? SP: For the past two years we’ve been with the same few producers: Shep Goodman, Aaron Accetta, and Christian Medice. Tracking drums with them is kind of funny. Christian is the only one with drumming experience so when they like something I do, they have to use Christian as a translator to describe what part they liked and why. On my end it’s a little hectic and confusing but it keeps me on my toes and challenges me a little bit to just nail it based on what I think they are looking for. We’ve tracked things a few different ways as well which has been challenging, but fun. We’ve occasionally recorded the drums and cymbals separately to really give the drum tones isolation and stop cymbal bleed entirely. It’s useful on the songs that have more electronic MIDI sounds blended with the drums themselves. Recording that way is equal parts challenging and fun. You can let your brain relax a bit and really lay into the backbeat for most of the song but then you get to a fill and have to stop your natural muscle memory from hitting the cymbals. So certain parts feel a bit more cerebral than normal, which is fun for me because I’m always up for a new challenge. With all of that said, typically tracking drums for Young Rising Sons is a breeze. I can sit down and knock out songs in a couple of takes and then we listen and make sure it feels good. ZF: You use a laptop and Roland SPD-SX pad while performing live. What do you use these for and why? SP: Yeah! I think in today’s industry there are lots of tools you can use to sound as close to the actual recordings as possible while also expanding what you’ve done and delivering that new element to the crowd. I love the technology side of things and finding out what I can add on without making the live set feel contrived or like it’s a different band. We run Ableton on a MacBook Pro for a few reasons, and the backbone of it is we can send a metronome to myself and the other guys as well as certain synth tracks and other miscellaneous sounds that wouldn’t be practical to create ourselves on stage. A huge part of it is being able to trigger and automate our intro and song transitions so the show stays fluid, while those on-stage things that have to occur can go on (tuning, guitar switches, beer chugs, instrument changes, etc.). It’s also allowed us to program and automate a light show which gives us freedom to make the lights appear however we wish as they are triggered entirely in Ableton and never miss a cue. If we decide to change color schemes or design, we can easily go back to the drawing board and re-model them ourselves. The Roland SPD-SX pad is my favorite part though, as it becomes an extension of my drum kit and lets me play all of those MIDI drum parts I spoke about earlier. Some of our songs have drum parts that are all electronic, or a blend of acoustic and electronic drums and the SPD-SX gives me an easy and effective way of accomplishing just that. I can just drop in the sounds I want, assign them to a pad, and play entire sections of songs on the pad just the way they were written. For example, I can use a snare on the pad but play the rest of the groove on my kit or I can assign sounds to a kick and snare trigger and blend my kit sounds with the MIDI sounds for just the right tone! It has endless applications, all of which allow me to customize and control more and more of the instrumentation of our live set, which is ideally what you want as a musician. The ability to control all of the sounds and manipulate them where I see fit has been a game-changer for us. Not to mention, it’s just loads of fun to mess around with, even in an acoustic or studio setting (or when you’re bored and binge-watching Stranger Things and you want to match the soundtrack). Roland gets an A+ from me, that thing is my new BFF. ZF: While shooting your music video for “Undefeatable,” you had to mute your cymbals and drums in order to play along to a backing track. How hard is it to mimic live-performance for the cameras? SP: It’s always a strange feeling that I think most film crews don’t really understand. 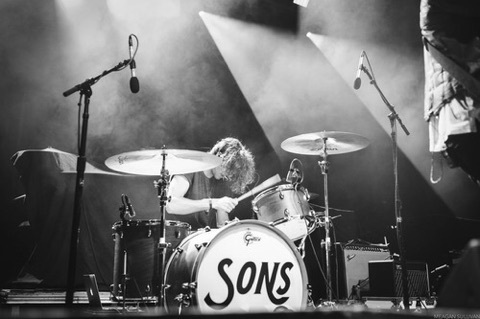 As a drummer, it’s SUPER easy to get in your head if something just feels a little off, so it’s a hurdle you kind of need to handle alone behind your kit. I think it’s all about knowing you’re going to look silly for the first few takes and then settling in and just pretending like it’s a real show. Once you’re adjusted it really isn’t so bad, but I do always find myself chuckling at it here and there. ZF: You just got off a two-week tour with 888 and The Moth & The Flame. Describe a typical day on tour. SP: We keep it pretty simple: wake up, shower, get dressed, COFFEE, drive to venue, load in, build stage, FOOD, soundcheck, MORE COFFEE, hang out—usually everyone has their own free time, interviews, photos, drinks, warm-ups, perform, take photos with every last fan, load out, drive to hotel, sleep, repeat! It always varies depending on the city and what press we may have or how long certain drives are, but this is the typical day I would say. Super exciting, right? ZF: How do you warm-up for a show? SP: I wish I had a better warm-up, but really I just drink Jameson and stretch. I’ll pull out the drum pad and work through some rudiments for a bit and if I’m feeling particularly stiff I’ll do a few jumping jacks or push-ups to get the blood pumping. It’s mostly the Jameson that does it. ZF: What back-up gear do you always keep with you on the road or in the studio? SP: Mostly just back-up snares. We were on tour with The Kooks when I somehow hit my snare so hard that the rim of the drum broke in half and I was SUPER thankful to have an extra! (Don’t ask me how, I think it was a defective rim or something – I’m not even that strong). ZF: What is the best show you’ve played? SP: This is a tough one! Honestly we have played so many good ones that I can’t pick, so I’m going to go with the lazy option and choose a hometown show! 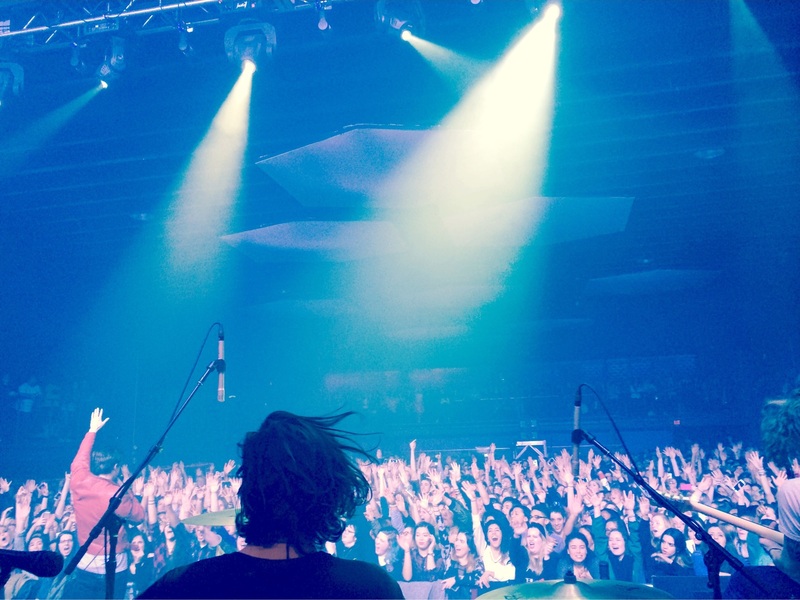 We played Starland Ballroom in NJ with The 1975. It was the first time our friends and family had ever seen us play at home in New Jersey since we had signed a record deal and it was a special moment. Running into old friends and new friends who were all equally excited for us was a cool feeling. There was a sense of family in that room, plus it was right before the holidays so it was a talking point when we got home among all of our friends and family. It was a really memorable night. ZF: On your most recent tour, the band performed several free acoustic sets for fans under 21 who were unable to attend your concerts. Explain how the band came up with this idea and describe your acoustic setup. SP: A large portion of our fan base is under 21 and a few venues wouldn’t budge on their age restrictions due to local laws, so we wanted to figure out a way to still say hello to our fans that we haven’t seen in a while that couldn’t make it in. I think Andy came up with the idea to do acoustic meet and greets and obviously we thought it was a great idea. As for our acoustic set up, we wanted to figure out a cool way to get everyone involved and it so happened I started playing ukulele recently, so we figured why not try it out. It brightened up the performance and every song seemed to translate well on it. We had messed around with it for a bit when we realized it was missing a percussive element. I was already using a cajon as a seat and realized, I can’t use my hands but a kick drum pedal would work! So I grabbed one and we just went with it. The whole idea behind the acoustic set is that all three of us can be flexible and play any of the instruments we’re using, so it allows us to mess around and swap instruments to create a new feel to a song we may have played 100 times in a different way. It’s a fun challenge for me to sing, play ukulele, and also play kick patterns while Julian uses a tambourine as a snare. It’s like I’m solving a real-time puzzle in my brain and it all fits together in motion. ZF: Is Julian a better tambourine player than you? SP: IN HIS DREAMS! I am the tambourine master. He’s pretty damn good though, he looks so good while playing it. 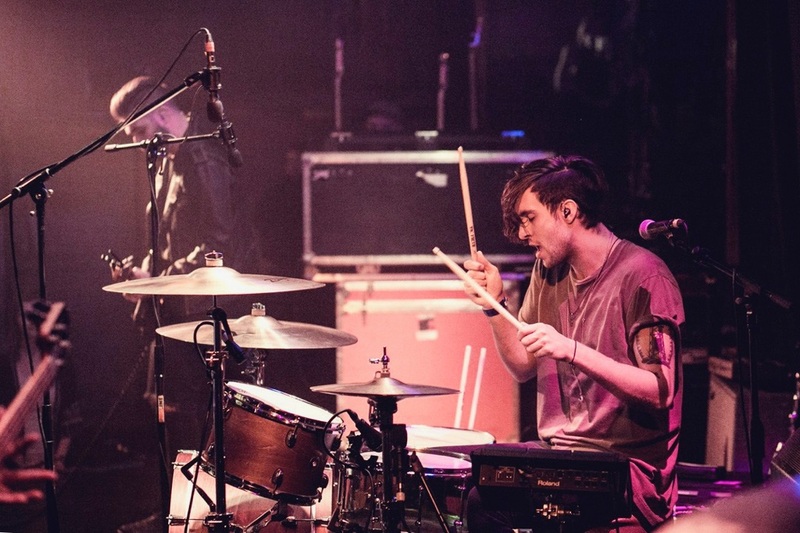 ZF: You’ve been playing drums for 15 years and signed to Interscope Records in 2014. How has the transition been from aspiring musician to signed professional? SP: It’s interesting, I don’t feel any different! I just enjoy it immensely and I’m lucky to be able to wake up every day and play. Just enjoying the ride!